Critics and fans alike hail pianist and composer Satoko Fujii as one of the most original voices in jazz today. She’s “a virtuoso piano improviser, an original composer and a band-leader who gets the best collaborators to deliver,’ says John Fordham in The Guardian. In concert and on more than 50 albums, the Tokyo resident synthesizes jazz, contemporary classical, avant-rock and Japanese folk music into an innovative music instantly recognizable as hers alone. Since she burst onto the scene in 1996 after earning her graduate degree from New England Conservatory, Fujii has led some of the most consistently creative ensembles in modern improvised music. Her trio with bassist Mark Dresser and drummer Jim Black has released numerous albums, all of which earned places in critics’ year-end Top 10 lists. In 2001, she debuted an electrifying avant-rock quartet featuring Takeharu Hayakawa, Tatsuya Yoshida, and Natsuki Tamura, and their high-energy albums were hailed by listeners worldwide. 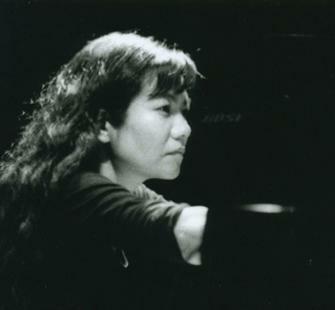 Fujii has also established herself as one of the world’s leading composers for large jazz ensembles. Since 1996, she has released a steady stream of acclaimed releases for large ensemble including simultaneously releasing four big band albums in 2006. In addition to playing accordion in her husband Natsuki Tamura’s Gato Libre quartet, she also performs in a duo with Tamura, as an unaccompanied soloist and in ad hoc groupings with musicians working in different genres. Her special projects have included collaborations with saxophone quartet, violinist Carla Kihlstedt, a quartet with Dutch pianist Misha Mengelberg and trumpeters Angelo Verploegen and Natsuki Tamura, and a trio with vocalist Koh, and accordionist Ted Reichman.